Nothing is like a journal or notebook bound in fine leather. The feel, smell and rugged beauty of the material makes for a book that looks elegant and will last for many years. We use only 100% vegetable tanned goat with archival quality. The leather itself has a natural surface and is not artificially stamped or enhanced, and it is almost as smooth as calf skin. 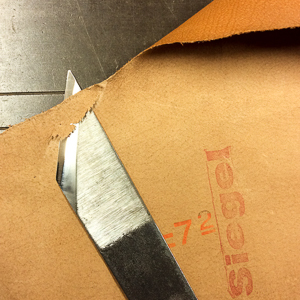 Truly a nice leather that mass produced leather books will never offer. We offer two styles of leather bound books: Leather spines with Italian hand-marbled paper covers, and full leather bound books. Both have 188 pages. The medium size book is approximately 8” tall by 7” wide, while the large size is 9 3/4” tall by 7” wide. The interior pages are of a natural white writing paper with a textured surface and deckled edges, giving the look and feel of a hand-made paper. The pages for the large book are available in blank or printed with lines, spaced 1/4” apart. The medium book is available with blank pages only. We sew our own book blocks by hand, and the book will stay open flat. The leather spine with marble cover book has a squared spine with a creased hinge. The transition from the leather to the marbled paper cover is accented by a matching or contrasting thin trim. The full leather book has a single all leather cover, that wraps around the book from front to back. Its spine is rounded and the cover boards are inset so there is no visible spine or transition. The look simple and elegant. We can optionally personalize it by foil stamping your monogram on the cover in 18kt gold foil. Book styles are finished with headbands and matching color ribbon bookmarks. Both the leather and marbled papers are natural materials and hand-made (or dyed,) so there are variation in color and texture. 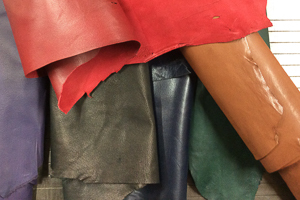 The leather may show natural wear or imperfections (but no holes.) We’re happy to send you a picture of the actual leather and marbled paper we would use for your order before making your book. Just send us a note with your order.